The 2018 Electronic Accounts Payable Benchmark Survey Results (the “Report”) provide a comprehensive analysis of survey responses regarding the use of “electronic accounts payable,” including trends, benchmark data, and variables that factor into program success. The survey defined Electronic Accounts Payable (EAP) as “non-plastic commercial card accounts used to pay for goods and services after an invoice has been received for those goods or services (in other words, card payment did not occur at the point or time of sale).” The Report is based on over 1,100 responses from EAP end-users representing public and private corporations, State and Federal government agencies, Cities and Counties, Colleges and Universities, School Districts, and Not-for-Profit organizations. All corporate sizes (Fortune 500-Size, Large Market, Middle Market, and Small Market) are represented in the Report. Thirty-two different EAP providers, all major EAP-providing brands are represented in the survey response. Each of the key findings from these reports is summarized below. EAP is primarily used for goods and services which may be considered too expensive for payment with plastic purchasing cards (where, among EAP users, the average plastic transaction amount was $367 in 2017). One-half of all respondents had used EAP to pay for a single purchase of a good or service in excess of $150,000 in the past year and one-quarter of respondents had made at least one EAP purchase in excess of $400,000. In terms of dollars, respondents report that about 50% of EAP payments are for operating expenses (including operating goods and supplies, office equipment and supplies, and computer-related hardware and software) and about 21% for assets (primarily inventory). The remainder of EAP payments are spread across a wide variety of services (e.g., professional services, education and training, and contractual repair and maintenance). The vast majority of respondents (73%) report growth in EAP spending over the 2015-2018 time period. Over that time frame EAP spending grew, on average, by 10.9% per year. Going forward, 75% of all EAP-using respondents expect increases in EAP account spending over the five-year period from 2018 to 2022. EAP spending, estimated to be $89 billion at the end of 2017, is expected to rise to $127 billion by 2022. The major reasons for expected growth in EAP spending include increased supplier acceptance of EAP, efforts to target commodities for EAP payment, and efforts to target high-dollar transactions for EAP payment. RPMG estimates market potential for EAP to be $1.2 trillion based on estimates of the current state of adoption, use, and acceptance of EAP. EAP is still limited in market penetration with new adopters on-boarding each year. Current EAP-using customer estimates of their own potential for EAP spending growth are nearly 4-fold over their current spending level. Respondents estimate the full cost of invoice processing and payment by check to be $39. By contrast, respondents estimate the average cost of EAP invoice payment to be $13, yielding a $26 per-transaction cost savings when EAP is used. Further, on average, 46 days of working capital float becomes available under EAP facilitated by invoice due dates, the time gap between payment by EAP and billing from the EAP provider (average daily credit balance) and the payment grace period. With average monthly EAP spending of $3.0 million, there is additional working capital of $4.7 million made available due to the use of EAP. Eighty-two percent of respondents report a decrease in check writing since the adoption of EAP. The value of EAP over other payment methods is recognized by the majority of respondents across a wide variety of payment criteria, including incentives and rebates, the ability to track supplier payment receipt, the ability to cost-effectively transmit remittance information to the supplier, the speed with which payment is transmitted, the security of payment, the ability to support both low and high volume purchase activity with suppliers, the ability to control timing of settlement, per-transaction charges, bank fees other than per-transaction charges, the ability to control spending, and minimization of errors, corrections, or rework to complete payment. The vast majority of respondents indicate that EAP has been valuable at reducing reliance on checks, enhancing the organization’s financial position, improving organizational processes, enhancing cybersecurity, increasing spending transparency, and strengthening control over spending. Respondents indicate that in 2018 they paid 24% of their supplier base with EAP, up from 17% in 2015. The percentage of respondents that are “satisfied” or “very satisfied” with supplier acceptance of EAP has nearly doubled, growing from 24% in 2015 to 45% in 2018. Fifty-one percent of respondents estimate that EAP spending would double if all suppliers that they desire to pay with EAP accepted payment in this manner. EAP program performance is improved in organizations that (a) target and engage with their suppliers about the payment method, (b) incentivize suppliers to accept EAP payment (e.g., negotiate faster EAP payment timing), (c) accommodate and support suppliers (e.g., helping the supplier seek and obtain lower interchange rates for large-ticket purchases or having a clear EAP acceptance on-boarding process), (d) formalize the payment method by RFP or technological choice, and (e) press the case with suppliers by revisiting the issue of acceptance with regularity. Suppliers that do not accept EAP payment put some portion of their revenue stream at risk. Respondents accounting for 75% of EAP spending (about $67 billion per year) report changing suppliers for not accepting EAP. The 2018 Electronic Accounts Payable Benchmark Survey Results examines best practices of "high performing" EAP programs. The Report provides unique and fresh insight into the philosophies and actions of “best practice” EAP programs, broken into three key categories: (1) growth drivers, (2) supplier relationships, and (3) aspects of organizational awareness. 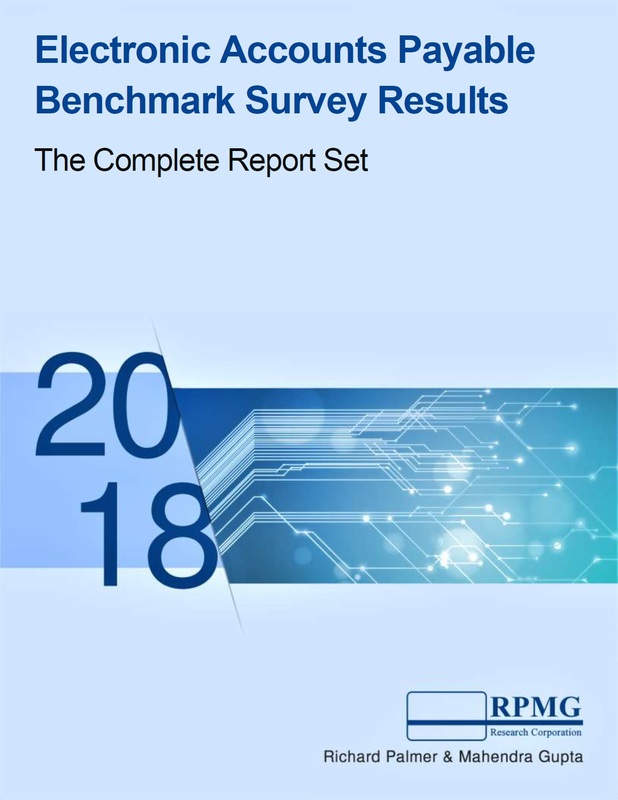 The 2018 Electronic Accounts Payable Benchmark Survey Results provide additional details to support the topics above and address a host of other important issues, including the power of benchmarking and its impact on EAP program performance, EAP application in mobile technology and e-procurement software, the use of EAP by aggregators (e.g., travel agencies or TMCs) and internet marketplaces, the use of EAP outside of the U.S. and Canada, issues involving reconciliation and integration, data about and concerns over fraud or misuse of EAP, and the nature of ongoing challenges to EAP success. • the percentage of transactions paid with EAP within four spending categories: (a) $2,500 or less, (b) between $2,501 and $10,000, (c) between $10,001 and $100,000, and (d) between $100,001 and $1 million. • EAP program management activities. • the intent to switch providers and reasons driving those considerations. The complete set of reports from the 2018 Electronic Accounts Payable Benchmark Survey Results can be added to your cart by clicking the button on the right. For any questions, please contact Professor Palmer at Richard.Palmer@RPMGresearch.net.